Hikers and bikers enjoy recently restored portions of the Historic Columbia River Highway. 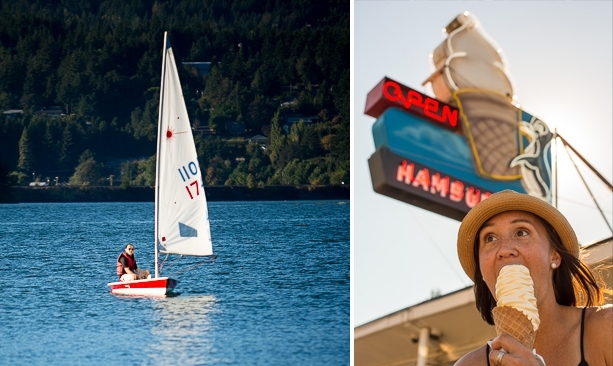 Leisure sailors and international racers come for Cascade Locks's world famous winds. And you have to stop for the giant soft-serve ice cream cone. The EASYClimb mountain bike trail near the water is part of an extensive trail network to be built in the future. 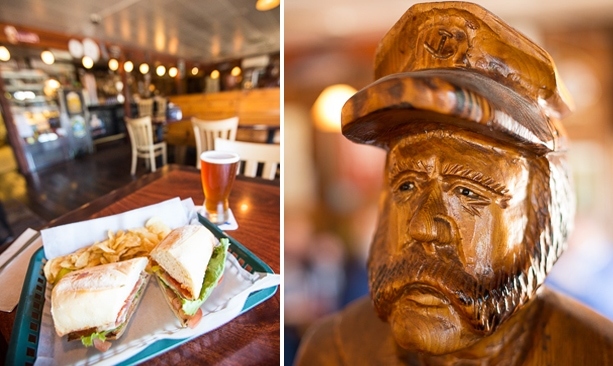 Cascade Locks Ale House has great sandwiches and tasty brews. Legend has it that long ago, two brothers — sons of the Great Spirit — ruled the lands to the north and south of the Great River, spanned by a mammoth chunk of basalt known as the Bridge of the Gods. Brothers Pahto and Wy’East were at peace until a fair maiden entered the land. Loowit was a golden-haired beauty with a sun-bright smile. The brothers fought over her with cascades of boulders, mud avalanches and raging torrents of rain. Their sparring was so great that the Bridge of the Gods collapsed and created great rapids in the river. Their father was so enraged that he turned the brothers into mountains: Pahto became Mount Adams and Wy’East, Mount Hood. And Loowit disappeared. 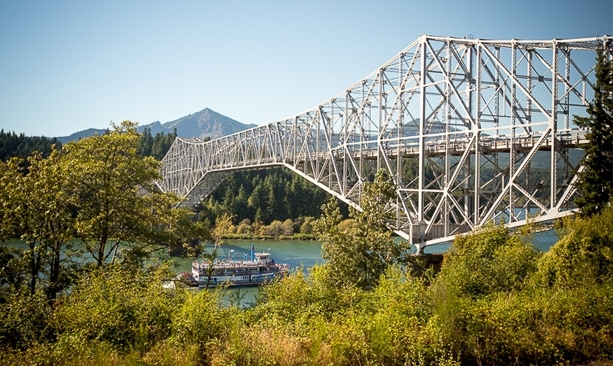 The present day location for this legend is the quaint riverside town of Cascade Locks. I live just down the road in Hood River and decided to spend some time exploring the town on a recent summer day. Even for an admitted adrenaline junkie like me, it takes a full weekend to cover this beautiful, adventure-packed town. 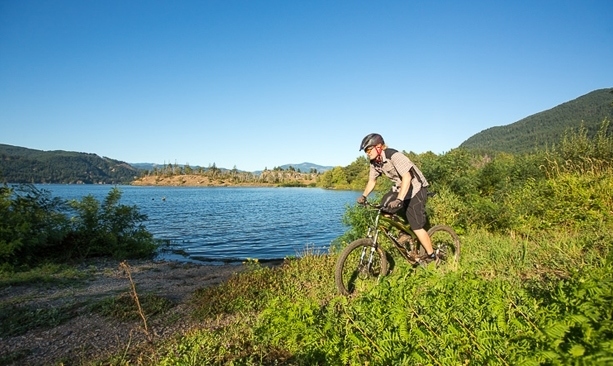 Families and thrill seekers alike can tackle the trails, waters and forests of the Columbia Gorge without the busyness (and higher prices) of other towns. During my weekend in Cascade Locks, I keep an eye out for Loowit whispering in the winds that play through the tall, old-growth Douglas-fir, western red cedar and mountain hemlock woodlands. This hamlet of 1,120 people initially was a Native American fishing village. In 1843, Captain John Freemont named the 2-mile-long rapids, formed from giant boulders of the natural basalt bridge that collapsed eons before, “the Great Cascades.” This spot was the penultimate crux for Oregon Trail travelers who navigated the rapids by lashing wagons to rafts. In 1862, the state’s first steam engine, dubbed the “Oregon Pony,” pulled boats through these rapids. In 1896, with the coming of giant sternwheelers, the Army Corp of Engineers carved a channel 460 feet through the volcanic basalt and installed the locks. When Bonneville Dam fired up in 1938, the channel was flooded and decommissioned, but remnants of the locks and the Oregon Pony remain visible at the Cascade Locks Marine Park. I start my exploration with a jaunt up one of the best trails in Oregon, Eagle Creek #440. You can take a dip in Punch Bowl at mile 3 or hike to Tunnel Falls, where a tunnel goes behind the falls at mile 7. More adventurous folk can catch a section of the Pacific Crest National Scenic Trail right from town. This is the lowest elevation and only town on the 3,000-mile, Mexico-to-Canada trail. Hike out and then back for as long as your spirit moves you. Cyclists can spin most of the restored Historic Columbia River Highway (HCRH). In September 2014, a section was completed making it possible to start from Troutdale, just outside Portland, and ride to Wyeth, just 8 miles shy of Hood River. Cascade Locks is smack in the middle of the Troutdale-Wyeth section. I rode the whole shebang in a half day. 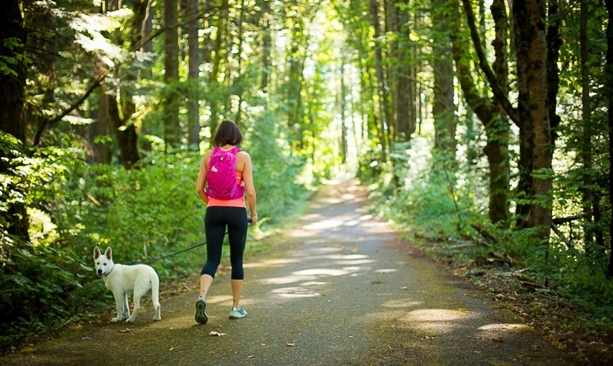 Families toting a bike trailer or tag-a-long tandem can pick up the HCRH bike-path just under Bridge of the Gods in Cascade Locks and cruise the beautiful, lush, car-free section west 2.4 miles to Eagle Creek. If you are of two-wheel, single-track persuasion, check out the new EasyCLIMB (Cascade Locks International Mountain Bike) trail at the port. The EasyCLIMB trail is currently 3 miles of twisty track through mostly flat white oak forest and grass savannah. For the race savvy, the EasyCLIMB hosts the spring Gorge Short Track mountain bike competitions on Thursday nights. Another 25 miles of trails is planned for the area. Biking and hiking out of my system, I look for some afternoon waterplay. Blackberry Beach, just east of town, is a new windsurfing and kitesurfing launch at Port of Cascade Locks. It’s a great alternative to summer crowds elsewhere in the Gorge and perfect for fall easterly chinook winds. If a bigger boat is more your fancy, launch a sailboat at the Marine Park, which has some of the best sailing on the Columbia River. The Columbia Gorge Racing Association organizes sailboat races all summer. Check out one of the youth regattas or the legendary mid-summer downwinder dubbed Double Dammed from Cascade Locks to The Dalles. I like to plug in a bit of cultural and educational activities on any adventure, so I take a short tour of nearby Bonneville Lock and Dam to view the locks in action and peer into the murky fish ladder windows to spy anadromous migrating chinook and coho salmon and steelhead trout. The original 1896 locks at the town center were flooded and replaced by Bonneville Dam Locks. The current locks are 85 feet wide and 676 feet long. For passing sailboats, grain barges, lumber tows and juvenile fish transports, it takes about 30 minutes to pass through. The nearby fish ladder is 60-feet vertical. In summer one can watch sockeye salmon and steelhead trout leaping upstream. September brings runs of coho and chinook salmon. At the Bonneville Hatchery, don’t miss a visit to see Herman, the 11-foot-long, 500-pound, 70-year-old white sturgeon (and tykes can feed juvenile salmon). Who knows, during your visit to Cascade Locks, you may even spy the spirit of Loowit, who some say was turned into Mount St. Helens. Others say she’s still wandering the land in beauty among the giant Douglas-fir forests and Great Cascades on the Columbia River. Cascade Locks Ale House serves pizzas, sandwiches and a nice selection of Oregon’s famous IPAs. Thunder Island Brewing, down by the water, is the newest craft brewery in the Columbia River Gorge. Get your caffeine jolt at Jumpin’ Jax Java on Wa Na Pa Street. Brigham Fish Market is the place to buy native-caught fish from a family who has been fishing on the Columbia River for three generations. If you plan to stay overnight, check out the Best Western Plus Columbia River Inn. Located right on the water, the property has beautiful views of the river and the Bridge of the Gods. It’s within easy walking distance of local restaurants and pubs, too. Author, mountain rescue doctor, global adventurer, and cyclocross racer, there’s no shortage of adrenaline in Dr. Christopher Van Tilburg’s days. 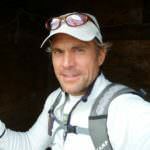 His recently released "Adrenaline Junkie’s Bucket List: 100 Extreme Outdoor Adventures to do Before You Die" (St. Martins, 2013) details action-packed journeys around the world.